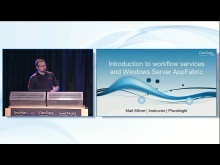 BizTalk Server, Windows Server AppFabric and Windows Azure AppFabric all provide messaging infrastructure. However, each offering provides different features and addresses different scenarios. In this session we will draw the distinction between those scenarios and show not only how to choose between these platforms, but how to use them to complement each other in a single solution. You will learn how to expose both BizTalk endpoints and Server AppFabric services on cloud endpoints. The routing service will be explained with a real example of routing messages between WCF services hosted in Server AppFabric and submitting messages to BizTalk Server.